Our repeating jobs feature is meant to automate the task of creating duplicate on-going jobs for scheduling purposes that are predetermined. That definition does not necessarily include invoicing. The reason will be more clear as I describe how the repeating job feature works. The first job in a series of repeating jobs is considered the beginning of the series or template. It is the job that is used to create the subsequent jobs in the series. We recommend that before you set that series you complete the first job, then validate that each of the four items mentioned above are as you intend them to be for the next job and beyond. 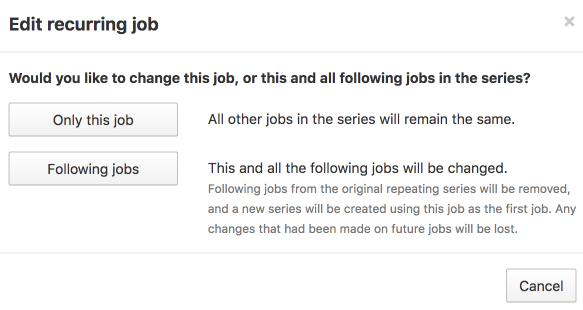 If you do need to update the beginning series then a pop-up window will appear explaining that this will update all jobs in the series. The subsequent jobs do provide an option to just update that particular job or all future jobs. Each interval allows you to decide the frequency (1 - 30).